As penmanship and the act of hand-written missives enjoy a revival, by-products of the cultural return to a more “analogue” world, Montegrappa has experienced remarkable growth. The renewed appeal of the fountain pen runs parallel to the rebirths of the mechanical wristwatch, the vinyl LP and the physical, paper book. 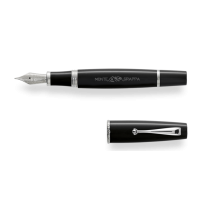 To celebrate this phenomenon, Montegrappa launched a family of pens that lauds a return to authentic values: MONTE-GRAPPA.